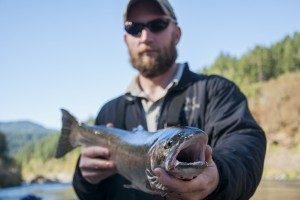 We returned a few weeks ago from our annual fishing trip in Oregon, but we still can’t stop talking about it. 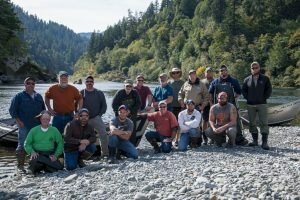 For our fourth year escorting veterans down the Rogue River, we knew what great things to anticipate; but each trip brings together a new group of servicemen, which makes for new friendships and new thrills. This year we included four veterans of the Vietnam War: Tim, Top, Bob, and Chester. Bob was part of a Marine Corps battalion known as the “Walking Dead.” He lost his whole squad in June 1969, and he was shot and bayoneted. Wounded but not crushed for good, he was awarded the Bronze Star Medal with Valor for destroying an enemy machine-gun nest that attacked his unit. 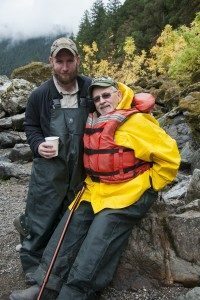 During the Rogue River trip, Bob surprised us, saying, “This is the first time in 50 years anyone has told me thank you for serving in such a way.” The others confirmed. Top, a sergeant major who was a door gunner for an assault helicopter company during 1967-68, also served in military intelligence, until he retired in 2003. He told us that no one had shown him any gratitude for his service until this event with Freedom Alliance. These four fellows spent their time on the river with seven Marines, who saw combat in Iraq and Afghanistan, and many of whom sustained injuries in the line of duty. Before tackling the river, we spent an extra day in Grants Pass, Oregon, to shake off jet lag and break the ice a bit. A local wildlife rehabilitation center allowed us a private tour, during which we saw owls, hawks, and eagles. 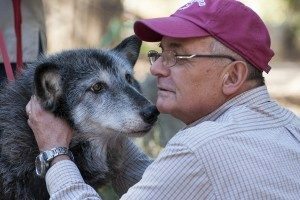 The staff brought out a gray wolf for us to pet, and we also saw black bears, brown bears, and a cougar up close. Then that evening, we gathered to meet the donor for this event, Jerry Schuld, at his son-in-law’s nearby ranch. Mike Dawson invited us to stay for dinner, and the men took advantage of the opportunity to get to know each other better. 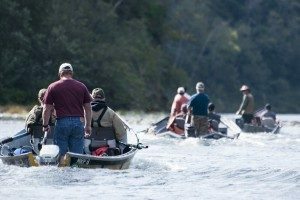 The next day, Bret Clark and the Briggs Rogue River Trips guides met us at the water’s edge with six drift boats, under a sky of heavy clouds. Fortunately, Freedom Alliance purchased rain gear a couple of years ago, which we leave in Grants Pass for times such as these. Rain began to fall as we commenced the 65-mile, four-day journey. 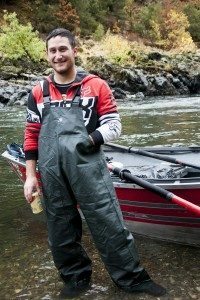 There would be rain and sun, pools and rapids—lots of fish, lots of eating, and lots of laughter. Especially the latter with Chester, who served with the Army in Vietnam (1966-68), along for the ride. Each day, the men sat eating their lunches along the banks of the river, while Chester would stand in the middle and tell jokes. When we came upon a series of complicated rapids, we hiked the shoreline until we could re-board the boats. This was quite a challenge for some in our group. 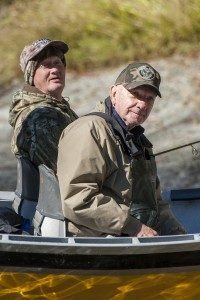 Tim was injured during his service with the 1st Calvary (1965-67), and he had recently undergone a knee replacement. 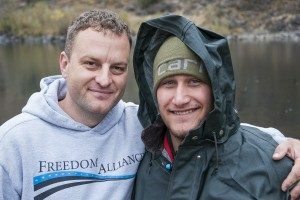 Stephen, a Marine with three tours of duty, kept a firm hold onto Tim’s life vest as he maneuvered the muddy trail. The Vietnam veteran was all smiles when he made it to the other side of the falls. During the expedition, we overnighted at three different stops along the river: Black Bar, Marial, and Lucas Lodges. 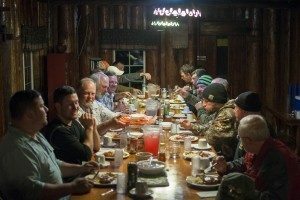 Family-style dinners, blazing fires, and rustic cabins comprise each of these establishments, and we were grateful to have a roof over our heads and comfortable beds to sleep in. The lodges also saw us off with grand breakfasts, just the thing we needed for a day on the water. But hunger was never a factor. Bret and the boat captains banked the boats to grill our catch for the mid-day meals, and Bret’s wife packed delicious homemade sides and desserts to complement the main course of salmon and trout. On our last day, a pair of bald eagles dove for fish only yards away from the boat carrying Karl and Daniel, both medically retired Marines who served in Iraq. 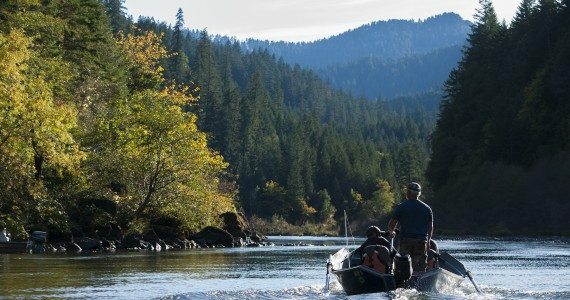 This reminded us that the Rogue River is always an unparalleled adventure, with sights and scenery that never fail to take our breath away. What an honor to be able to share that with our military heroes. Before going home, the men had one last chance to meet with Jerry and Mike, so that they could see what a difference the river had made. What happens on the river, stays on the river … but also in our hearts and minds, leaving them changed for the better. Rogue River, we’ll see you next year.